Sauté onion & garlic in olive oil over medium-low heat, stirring frequently, until softened but not browned, about 8 to 10 minutes. Season with salt, pepper, and cayenne. Add zucchini and cook until softened, about 10 minutes. Add the vegetable stock and thyme sprigs and bring to a gentle simmer. Cover and cook until the zucchini is very soft. Remove from heat. Discard thyme sprigs, and add cream and a squeeze of lemon juice. Working in batches, puree the soup in a blender until smooth. Pass through a fine-meshed sieve for a silky smooth texture. 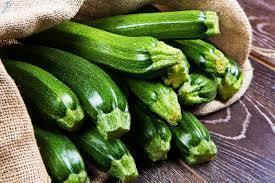 Garnish with julienned raw zucchini and fresh basil. Serve hot or chilled.